Apple, the nation’s most profitable corporation, revealed its quarterly earnings report earlier this week, providing the first concrete indicator of just how big a boost the new tax law is for the tech world darling. The report, covering the first three months of the company’s activities under the new tax rules, shows $16.1 billion of worldwide pretax income, and an income tax provision of $2.35 billion, for a tax rate of 14.5 percent. By comparison, the company’s effective tax rate for the first three months of calendar 2017 was 24.9 percent. If last year’s effective tax rate were still applicable, the company’s first quarter income taxes would be $1.68 billion higher. 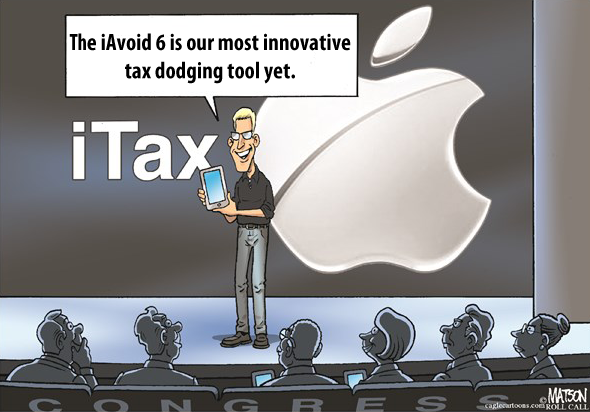 If its recent tax savings are a predictor of how Apple will fare over the rest of 2018, the company could see a net tax reduction of $6.7 billion in 2018. This is in addition to the $40 billion one-time tax savings ITEP has estimated Apple will receive from the deemed repatriation tax provision in last year’s tax bill. To state the obvious, all the billions that corporations are “saving” in taxes are billions less in federal revenue. Instead, we have growing deficits and empty promises that tax cuts will create economic growth and trickle down to workers. For example, Apple CEO Tim Cook vaguely promised back in December that the company would invest in workers and expand its business. But as we have noted elsewhere, the company’s promises on this front have been virtually content-free, making no specific guarantees about the amount of additional capital investments the company will make as a result of the tax cut. Apple’s evasiveness on worker investment makes more sense after seeing another big number coming out of the new earnings release: $100 billion. This is the amount of stock buybacks the company’s board recently approved going forward. To be clear, this is $100 billion the company could have spent on wage boosts or new capital investments in the United States as a sign of its gratitude for the new corporate tax cuts—but instead is going to send to its wealthy shareholders in the United States and abroad. These quarterly earnings reports show us, in real time, the money being transferred from the American public to corporate shareholders in the U.S. and abroad, as a result of the Tax Cuts and Jobs Act. Each quarter is likely to bring more evidence that Congress should repeal TCJA and replace it with real tax reform, to make sure that the next time Apple announces its quarterly earnings, it won’t be telling a story that sounds so good to its wealthy shareholders, and so empty to the rest of us.